I took this picture of Dhanaji Dongre, the farmer we visited during our Nokia Life Tools immersions, on my test N97 (which has a pretty cool camera but a lousy touch-screen esp. when compared to the iPhone). He is taking a picture of the crew on his own little camera phone, who in turn, are taking pictures and videos of him using really hi-tech cameras!! We had professional “filming” on by the Lonely Planet crew during our visits – to the right are Jere Hietala an immensely talented young Finnish photographer, and Brad from Australia, who was directing the film being made. Still, it must be remembered that photography is really a relatively new behaviour in India, encouraged by easy access to cameras on mobile phones! An interesting juxtaposition of low tech (note the manual plough worked by bullocks too) and hi-tech in several ways – almost as if several eras coexist side-by-side. 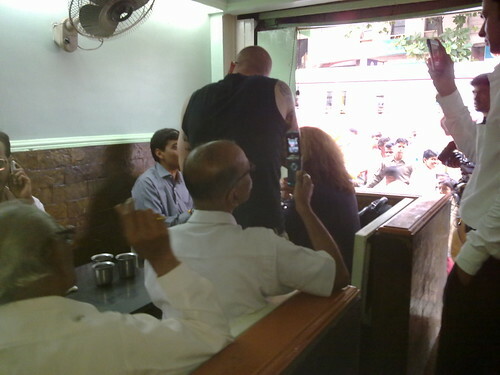 And it happens again during our Nokia Tej visit to Kolhapur which I will be writing up shortly – we’re meeting the sales Agent at a small tea shop in the crowded market, and other customers decide we’re interesting enough to capture on their phone cameras! Another example of this co-existence that struck me on my trip. In the picture below, on the right, you will see traditional accountants sitting on the floor, doing their manual accounting under the blessings of the Gods. It’s a huge open room, and to the left are desks with computers and the manager’s cabin which is equipped with the latest gadgets. 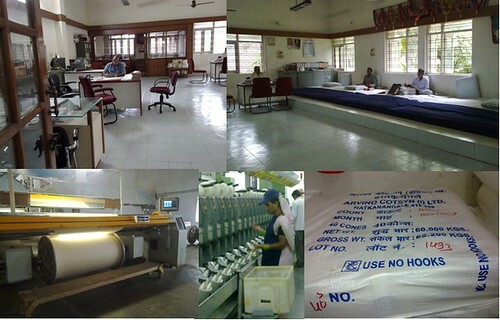 This is an old tradition of accounting, and the owner of Arvind Textiles in Icchalkaranji, Kolhapur told Frances Linzee Gordon and me that although most of his systems are now computerized, he would never let go of these employees who have been a part of the family business for many decades, and are like family members. The practice of manual accounting, according to him, will perish only when these people are no more!